Astrology.Care - What Interior Design Do You Prefer? Fire Zodiac Sign knows! Aries: Dynamicity and movement are equal to Zodiac number one sign. Most Aries homes do not match with Aries' love for street sport and gym. It is really doubtful that such person as Aries will regularly do all house cleaning and spend his or her time on it. That is why, they mostly prefer minimalistic design, so it looks tidy and there are no odd things to collect the fug. It looks clean and it is easy to clean - such strategy is best for Aries. If they do not clean their home regularly, they will be ok with the clutter. It is highly possible, because they just don't mind whether it is organized or not. A lot of storage places with ability to make a house as pragmatic as it can be are a great option for people like Aries. According to Western Astrological knowledge, Aries are considered to be the main in the house. It is recommended for Aries to have the room on the upper floor. If there is no such possibility it will be nice for them to have a big bed or a raised bed. They are very enthusiastic about new projects, but it is hard for them to pull them to the finish line. This works with remodeling as well. They like to create, so there may be few DIY ideas that Aries want to realize. Their homes are usually spacious with accents of luxury and small and rare decor items. 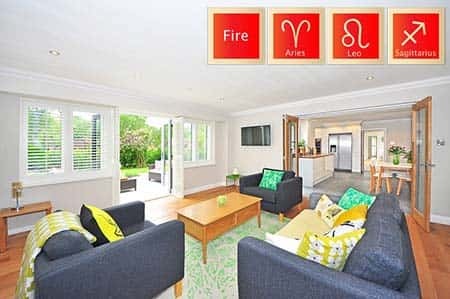 As Aries is a fire sign, it will be nice to use this element in decor - try candles or modern fireplace. Leo: Luxury and extravagance are the main components of a Leo's house. All the things in their possession should be interesting, wealthy, spacious, classy and upper-class. They want to be ahead of their time. Hey need to stand out and claim their excellence. They are the kind of people who make the castle out of their house, with lots of rich-looking details like marble and golden trim. Leos always know how their place should look like. However, Leos often need some time for themselves, to let their hair down and rest. So they need a special place for that. Each lion chooses what place it should be. Many lions may have their castles, but they will not want to boast with their possessions. They like everything soft: pillows, blankets, toys, beanbags, carpets. Most of them love pets very much and decorating and organizing a home to a pet would be an essential part of preparing for a pet. As for the luxury that they love, this type of luxury isn't gaudy or saturated in style. It is rather quality-oriented. Only the fabrics of the best quality can be a basis for their bedding, as well as the most endurable and reliable furniture or devices. Leos are quite modern in their decoration, so their bedroom is usually trendy. Bedrooms are of the highest importance, as Leos value most sleeping and having a rest. Sagittarius: Sagittarius is a very freedom-loving sign. They are not the fans of hidden and secluded spaces. It is always a bit uncomfortable for them to live in a small space. There are a lot of people with claustrophobia among them. That's why their homes are light and spacious. They are quite creative people and love to have the mix of styles in their interiors. Sagittarius feels freedom when he or she can mix styles whatever they want, creating something unique. Sagittarius loves not only simple aesthetics - they need everything to be well-thought and put a lot of mind work into their home. Colors for Sagittarius are all shades of purple, blue and other saturated colors. The more shades they see, the more space for experiment they get, which is amazing. 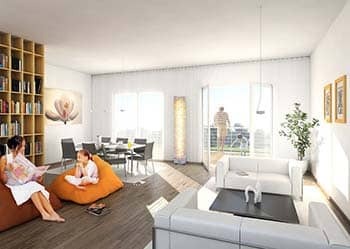 Though they love a lot of place and their perfect place of living is countryside, they still adore the city and don't want to refuse from all the city hub facilities. So they often try to find a consensus between these desires and live somewhere in the middle or in the very spacious modern loft. They love interesting designs, but never too saturated with things or overcrowded. Slight touches of eclectic mix with modern trend for "less is more" are the perfect interior combo of Sagittarius.